Following to the Okinawan specialty, Goya, I want to introduce another Okinawan specialty. First, look at this picture and guess what it is! Let me give you some hints. It is edible and from Okinawan ocean. Since it is also eaten in other countries in Southeast Asia, some of you may know what it is. The taste is not so strong but has hint of seaweed flavor. The feature of this food is more in the texture, which is like crunchy bubbles filled with liquid. 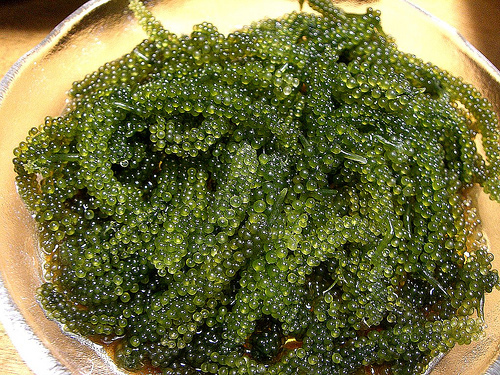 In Japan umibudo is eaten raw and seasoned with soy sauce or sanbaizu (soy sauce, vinegar, mirin, and sugar). It is often served with sashimi (raw fish), on rice, and soba. This is how umibudo are sold at supermarkets in Okinawa. 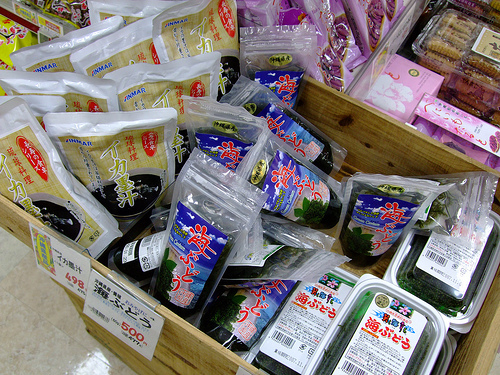 The right ones in plastic containers and the middle ones in plastic pouches are umibudo. It is hard to find them at in Tokyo, but sometimes found at Okinawan products fairs or local specialties fairs held at department stores, shopping malls, supermarkets or train stations.